True to its motto of “Making Great Music Personal,” the evening of music began an hour before curtain with a pre-concert talk open to all ticket holders. Andrew Norman, LACO’s creative advisor and composer-in-residence, conducted an onstage interview which felt like more like a relaxed salon discussion than a lecture (despite being at UCLA). In addition to having the two guest artists discuss works to be presented later that evening, Norman elicited delicious little tidbits such as guest conductor Peter Oundjian’s interactions with Britten and Karajan during his youth. In response to a brief Q&A, composer Sarah Gibson replied to the audience that her next project is a commission for the Tanglewood Music Center to be premiered in July 2019. Composer and pianist Sarah Gibson’s newly commissioned piece, Warp & Weft was inspired by Miriam Schapiro, pioneer of the 1970’s feminist art movement and co-founder of the feminist arts program at the California Institute of the Arts (CalArts). Schapiro coined the term, “femmage” to elevate the significance of women’s crafting in the home consisting of collages of cloth and fabric; this took place during an era when such works by women and folk artists were denigrated as “decorative” compared to predominantly male artists whose pieces were classified as “high” art. Inspired by Schapiro and the act of weaving and sewing, Gibson’s musical composition sought to represent these disciplines in musical line and form with the “warp” being large vertical chords while “weft” emerged by weaving throughout the piece as melodies. Making use of LACO’s performers deftly conducted by guest conductor Peter Oundjian, the work was a musical patchwork quilt incorporating the multitude of colors and activities of everyday public and private life and ended on a challenging frenetic and dissonant note, the sound of which reminded a concertgoer of the voices and sounds heard at Russian and Persian markets. (Coincidence or not, Schapiro was the only child of two Russian Jewish parents). Next on the program was Mozart’s Piano Concerto No. 17 in G Major, K. 453. Jonathan Biss was the pianist. He demonstrated his mastery of Mozart’s piano concertos with his graceful tone and elegant articulation. His pianissimo trills were ever so precise and yet so light as if angels on clouds were tickling the ivory keys of the piano - at times his pianissimo was so soft, they were nearly overshadowed by the orchestra in the background. During the pre-concert talks, maestro Oundjian described Biss as “an extraordinarily gifted pianist” and concertgoers felt similarly at the end of the piece, many standing to their feet and shouting “bravo” in appreciation. In a brief 4 minute musical interlude to the finale, the orchestra then performed Andante for Strings by Ruth Crawford Seeger, who is one of the most important and forward-looking composers from her generation who broke down barriers in the first quarter of the 20th century. In a programmatic reference back to the “new music” from the earlier part of the evening by Gibson, the on-stage artistry and versatility was on display by the orchestra led by Oundjian to bring to audiences the dissonant music tradition Seeger was part of. In a night of new music and old classics, the final work was Beethoven’s Symphony No. 5 in C minor, once described by E.T.A. Hoffman as "one of the most important works of the time.” The opening movement’s “short-short-short-long” 4 note musical motif is perhaps the most recognizable of Western music — so iconic and pervasively influential, it’s been turned into customized cell phone ringtone. The challenge of the evening presenting the classic work with a refreshing interpretation rested with the guest conductor. 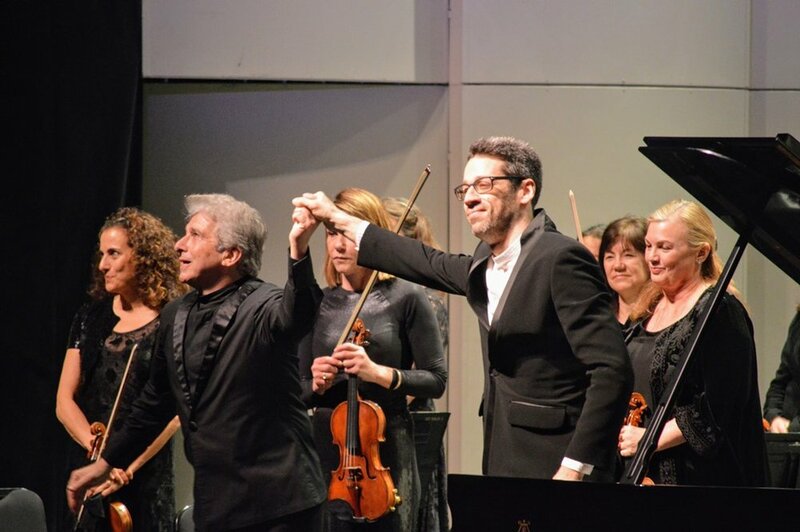 In a probing reading, maestro Oundjian made use of the chamber orchestra’s precision and unison, while not ignoring the elemental power of the symphonic piece. Instead of the oft-presented, overly foreboding and bombastic versions of the Beethoven’s Fifth, maestro Oundjian thoughtfully guided both the chamber orchestra and the audience into a journey ranging in moods from tumult, sweet melodies, grandeur, wonder and quick resignation at the end. In particular, the lyrical passages were conducted and performed with great care lending a bittersweet quality and suggested the idea that rather than filled with righteous rage, what Beethoven’s spirit longed for knowing his impending descent into an abyss of silence would have been fleeting sounds of the natural world. Elizabeth H. Onodera is a native San Franciscan. A translator and a researcher, she also writes about food and culture in various social media outlets as ‘foodshutterbug’. Elizabeth H. Onodera is a native San Franciscan. A translator and researcher, she also writes about food and culture in various social media as ‘foodshutterbug’.